I already wrote about it last week, but now it is official. 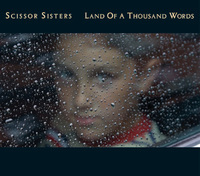 Scissor Sisters' epic ballad "Land Of A Thousand Words" will be the next single for the group in Europe. The video should be available soon and is rumored to be spectacular. Will keep you posted. In related news, highlights from the band's Halloween performance tonight at the Brixton Academy in the U.K. will air at 10 p.m. British time on Global-Cool.com. This charitable foundation, which launches globally in November, aims to defeat the problem of global warming. The Scissor Sisters webcast will be the first of many Global Cool events aimed at empowering individuals to make a difference. Catch the concert at 10 p.m. tonight here. The recorded live footage will be available for a short time after. So catch it while you can. I love the new Scissors Sister record but... is this really the best choice for a single? Actually, this is one of the few songs by them that does nothing for me. Same here, I always skip this one..but I know a few people who say this is their fave track, so who knows.